"This book has humor, attitude, clarity, science and common sense; it pulls no punches and takes no prisoners." "There are lots of people who'd prefer you didn't read this book: financial advisors, pension fund managers, regulators and more than a few politicians. That's because it makes plain their complicity in a trillion dollar scam that nearly destroyed the global financial system. Insiders Wilmott and Orrell explain how it was done, how to stop it happening again  and why those with the power to act are so reluctant to wield it." "Few contemporary developments are more important  and more terrifying  than the increasing power of the financial system in the global economy. This book makes it clear that this system is operated either by people who don't know what they are doing or who are so greed-stricken that they don't care. Risk is at dangerous levels. Can this be fixed? It can and this book  full of healthy skepticism and high expertise  shows how." "In a financial world that relies more and more on models that fewer and fewer people understand, this is an essential, deeply insightful as well as entertaining read." "A fresh and lively explanation of modern quantitative finance, its perils and what we might do to protect against a repeat of disasters like 2008-09. This insightful, important and original critique of the financial system is also fun to read." 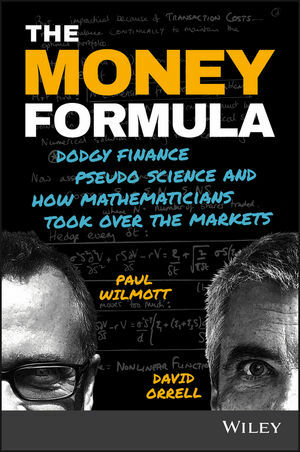 PAUL WILMOTT is a researcher, best-selling author, and consultant in most things quantitative, and has been a fund manager and academic. He is author of numerous books, including Paul Wilmott on Quantitative Finance and Frequently Asked Questions in Quantitative Finance. DAVID ORRELL is an applied mathematician, best-selling author and founder of Systems Forecasting, a scientific consultancy. He is the author of many books, including The Future of Everything and Economyths.